This journal describes my trip from LA to Portland on the Coast Starlight, and from Portland to Chicago on the Empire Builder. A few years ago, my wife and I vacationed at Glacier Park, and we stayed in Whitefish, MT, having flown into Kalispell, MT, and rented a car. The Eastbound Empire Builder stopped at Whitefish in the morning, and the Westbound train stopped there in the evening. 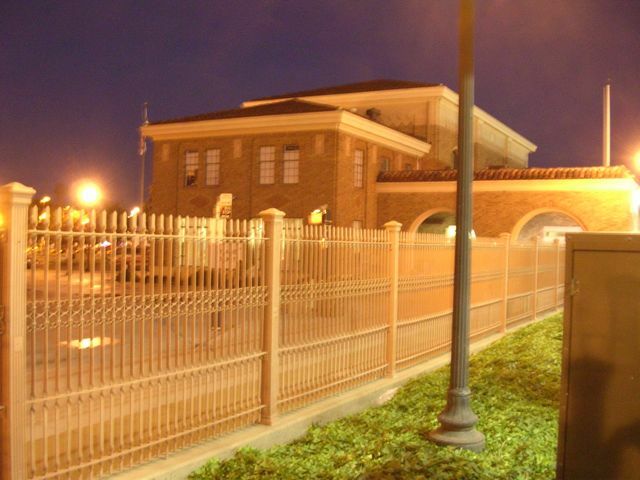 I was there at the station most mornings and evenings to see the train. We also drove to Essex, MT (Isaac Walton Inn), and East Glacier, other stops on the Empire Builder route. The beauty of the scenery, and the fact that this was one of the Amtrak cross county trains that I had not ridden, made me decide that I needed to ride this train. 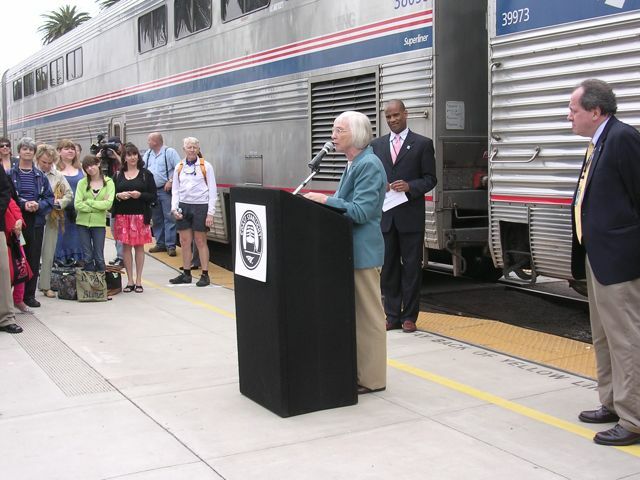 Amtrak's announcement of the upgraded sleeper (Pacific Parlor Car) service on the Coast Starlight beginning May 10 made me think that this would be an excellent opportunity to ride both the Starlight and the Empire Builder, which was upgraded a few years ago. Using my Amtrak Guest Rewards miles, I booked a roomette from LA to Portland on the Starlight leaving May 13, and a roomette from Portland to Chicago on the Empire Builder leaving on May 16. I booked a United Airlines flight back from Chicago for May 20, using United Mileage Plus miles. The landslide in Oregon (necessitating busing) will not be repaired by my travel date. The landslide in Oregon has been repaired and busing is not required on my travel date. The Parlor cars will not be available on my travel date. The Parlor cars will be available on my travel date. 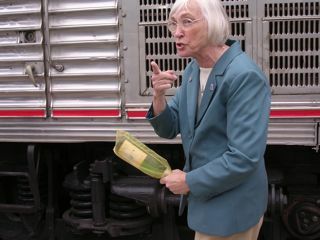 I finally talked to Marilee Bankert, Amtrak Field Marketing, who gave me what I believed to be the straight story: that the landslide had been repaired, and most of the upgraded equipment will be in place as of my travel date. But I figured that since I have no schedule constraints, I might as well wait until Amtrak's official date for the start of the upgraded service. So I changed my reservations, leaving LA on the Starlight on 6/10, and leaving Portland on the Empire Builder on 6/13. I was able to change all of the reservations, including the United Airlines return for 6/17, without any problems. 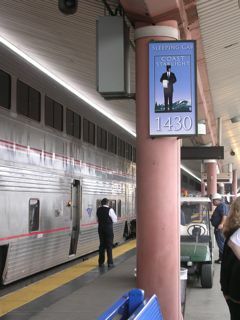 On the platform, adjacent to the sleeping cars, signs were posted giving the number of the car, presumably to help people find their accommodations. I did not notice any similar signs for the coach cars. 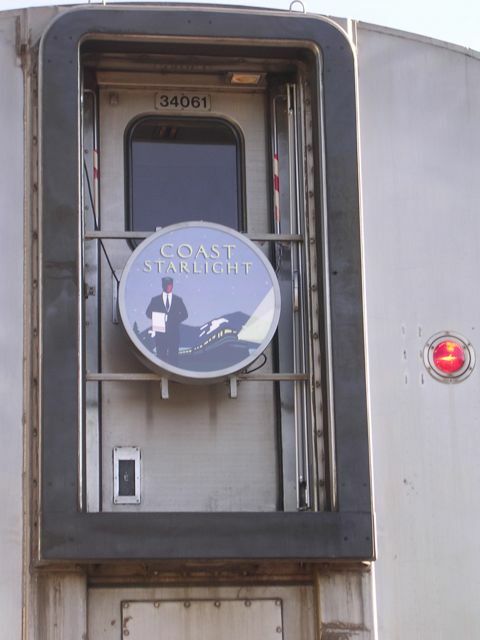 Early boarding began about 9:05 a.m. for the Starlight passengers off of the Surfliner. 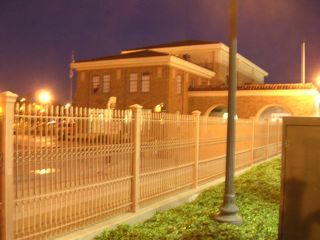 I put my bags in my room and met my car attendant, Joy Cortez, I then went to the Pacific Parlor Car to watch our departure from the station. We departed right on time at 10:15 a.m. In the Parlor Car, I met Ken Fiske, Amtrak Customer Service Manager and Brian Rosenwald, Chief, Product Management. 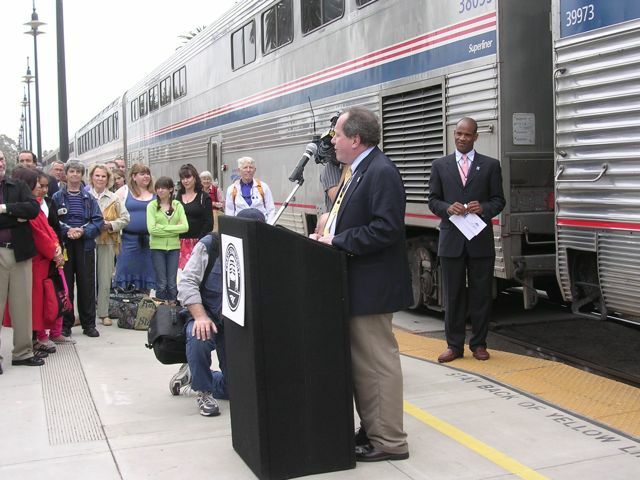 Brian was the Coast Starlight manager who, years ago, found the Parlor Cars (old Santa Fe El Capitan cars) in Amtrak storage, and had them modified for service on the Coast Starlight, making it the popular train that it is today. 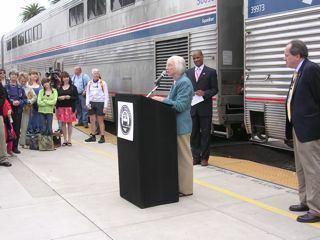 As we headed North, parades of people were being escorted through the train by Amtrak managers. Apparently most of these people were travel agents and others who were being introduced to the upgraded equipment. They were to get off in Santa Barbara and return via Surfliner or Amtrak bus. 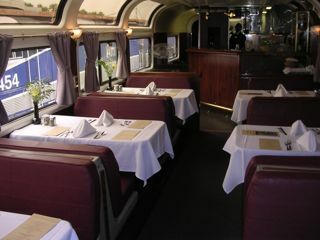 A new feature on the Coast Starlight is that sleeper passengers may opt to have their meals in the Pacific Parlor Car rather than the dining car. Choices are limited to about two entrees, and these are things that can be kept in a steam table in the car such as pastas, or meats in sauces/gravy, or items that are refrigerated, such as salads. I chose to have lunch in the Parlor Car on the first day. The choices were Classic Chef's Salad or Farfalle Pasta. I ordered the pasta, and it was served with a sauce with sweet peppers, mushrooms, shredded parmesan cheese and herbs. It came with a garden salad and a warmed ciabatta roll. It was quite good, and it was nice being able to avoid the crowds in the dining car. My daughter Lisa, who lives in Santa Barbara, had called me while I was on the Surfliner, on my way to LAUPT to tell me that she just saw on the news that Santa Barbara was having festivities at the train station to celebrate the start of the upgraded service. When we got there, there were about 10 minutes of speeches, followed by the mayor "christening" the train with a bottle of champagne. We left Santa Barbara at 12:59 p.m., only 11 minutes behind schedule. Most of the visitors (travel agents, etc.) 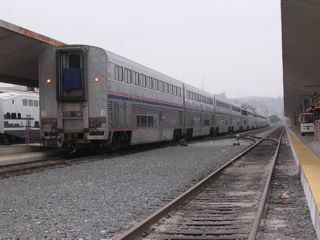 got off in Santa Barbara, although a few more got on in Santa Barbara and were riding to San Luis Obispo. 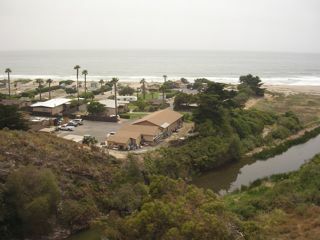 Traveling along the coast, we passed Vandenburg, and then headed inland, arriving in San Luis Obispo at 3:40 p.m. In SLO, I took a picture of the Coast Starlight drumhead that was on the rear of the train when we left LAUPT, but was covered up (see previous picture at LAUPT). Somewhere between LA and SLO it had been uncovered. Departure from SLO was delayed waiting for Southbound #11 to enter the station, which it finally did at 4:05 p.m. Our train departed immediately thereafter. 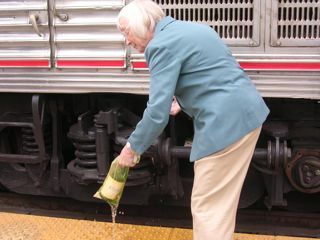 Upon leaving SLO, the wine tasting was begun in the Parlor Car. The wine tasting on the upgraded service differs somewhat from the wine tasting of the past. In the past, it was complimentary to sleeper passengers, and was not available to coach passengers. The conduct of the wine tasting varied depending on which Parlor Car attendant was running it, and the amount of wine received by the passengers varied accordingly. The cheese and crackers were put out on trays, for the passengers to take as they choose. On the upgraded service, there is a charge of $5.00 for the wine tasting, and they admit up to 40 wine tasters. They offer the wine tasting to the sleeper passengers first, but if insufficient sleeper passengers are interested, they offer the remaining seats to coach passengers. This is not only a source of revenue, but is also way to acquaint coach passengers with sleeper amenities, so that maybe next time they will upgrade. 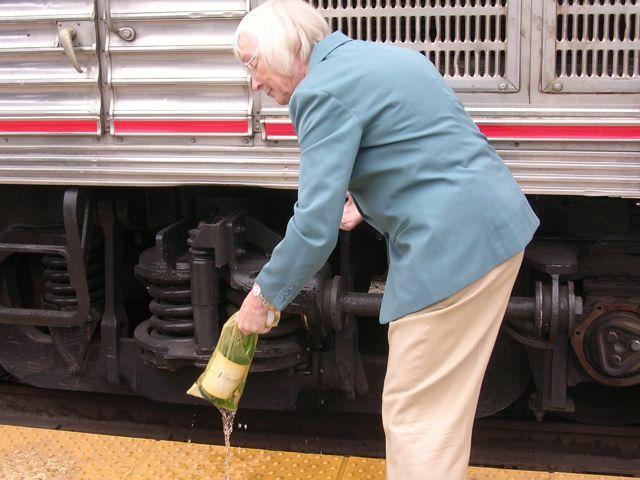 Brian Rosenwald ran the wine tasting on our train. He had four wines, 2 white and 2 red, and everyone was given a 1½ oz sample of each. The amount was controlled by spigots in the wine bottles which poured out a measured amount. Instead of taking cheese and crackers from trays, each wine taster was given a plate with chunks of cheese, and a couple of cellophane packages of crackers. My impression is that the old method of letting the passengers take the cheese and crackers from trays was better, although it did have the disadvantage of having people walking around during the tasting. One definite improvement over the old wine tasting is that after each wine is sampled, the attendant comes by with a pitcher of water and rinses out your glass for the next sample. The previous approach was just to pour the next wine into the remains of the previous wine tasted. I asked Brian if he was going to try to get all the Parlor Car attendants to adhere to the new format and he said that he would like them all to follow some basic guidelines, but would also like to give them some room to personalize their service. While the sky had been overcast for most of the morning, the sun was out by the time we left SLO, and apparently the air conditioning in the Parlor Car was not functioning at 100%. By the end of the wine tasting, the car was getting uncomfortably warm, which made me glad that I had taken a dinner reservation in the dining car. I went to the diner planning on choosing fish for dinner, but I found out that the fish of the day was trout, of which I am not particularly fond, so I chose the flat iron steak entrée instead. It came with mashed potatoes and vegetables, and was very good. 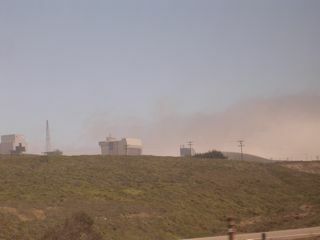 I sat with a young couple from Emeryville who had taken train #11 from Emeryville to Paso Robles in the morning, and were returning home on our train after having had two hours to explore Paso Robles. We arrived in San Jose at 9:07 and departed at 9:16 p.m., 37 minutes behind schedule. I decided to call it a day, and went to bed about 9:40.
visits since July 13, 2008.